LimeSDR is a low cost, open source software defined radio (SDR) platform that can be used to support just about any type of wireless communication standard. 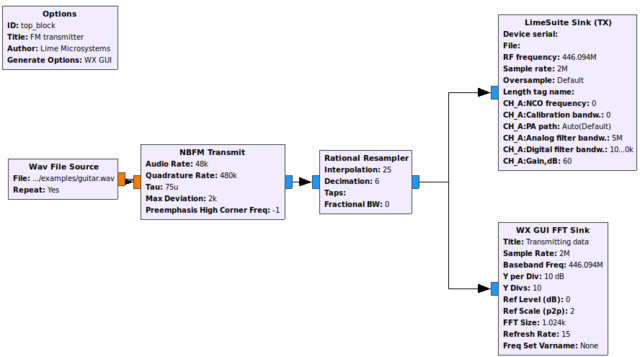 This document provides an overview of the installation process and operation of the gr-limesdr plugin for GNU Radio software. Currently this plugin supports LimeSDR-USB and LimeSDR-Mini boards. This section covers gr-limesdr plugin installation instructions. Currently plugin is tested and running on Linux and Windows platforms. Visit this link for information on how to install LimeSuite. Visit this link for information on how to install GNU Radio. If using Ubuntu system also install gnuradio-dev package. Now you should reload GNU Radio blocks by restarting GNU Radio or by pressing Reload blocks button in top bar as seen in Figure 1. gr-limesdr blocks appear under LimeSuite category. There are two options to install GNU Radio on Windows platform. Visit this link and download GNU Radio binary for your system. Install GNU Radio from binary. After you installed GNU Radio download precompiled and zipped package by visiting this link and extract it to GNU Radio installation directory. Usually GNU Radio installation directory is located in “C:\Program Files\GNURadio-3.7”. Now after restarting GNU Radio you should be able to use gr-limesdr package. 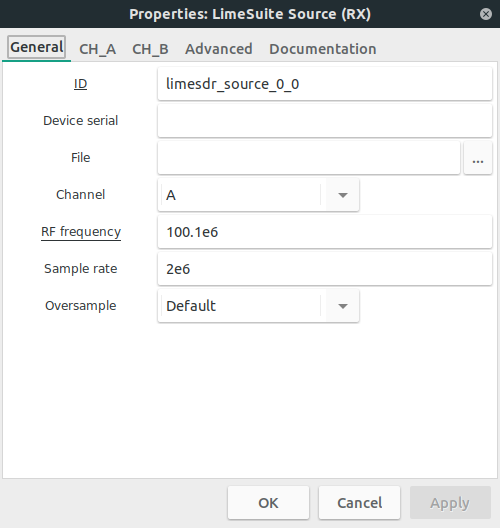 Alternatively to paragraph 3.1 you can select this option and install the whole SDR development environment made by Pothos SDR which include LimeSuite, GNU Radio, gr-limesdr and other useful tools. Just visit this link and select “Download installer” option. 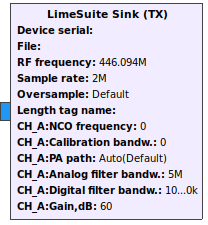 First you should pick LimeSuite Sink (TX) from LimeSuite category as shown in Figure 2. LimeSuite Sink (TX) block appears in GNU Radio workspace as shown in Figure 3. To configure block double click on it. Now you can see settings as shown in Figure 4. ID: ID of current block in GNU Radio environment. This is usually left unchanged. 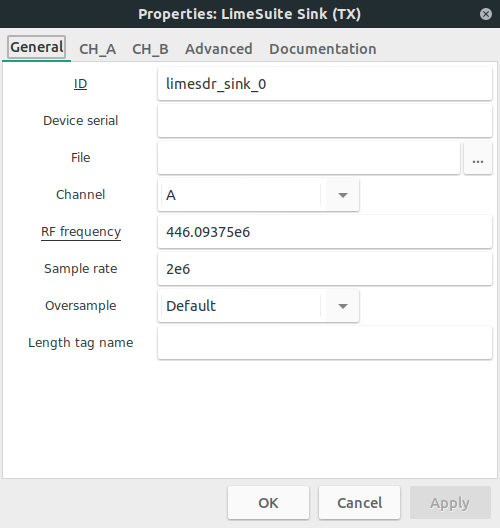 Channel: Use this setting to set single-input and single-output (SISO) or multiple-input and multiple-output (MIMO) chip mode. This setting enables/disables channels, sets correct number of streams and controls number of block inputs. In SISO mode you can select which channel to control (A or B). Note that not all boards (LimeSDR-Mini for instance) support MIMO mode. File: Select .ini file which you configured and saved by using LimeSuiteGUI. This setting should match in LimeSuite Sink (TX) and LimeSuite Source (RX) blocks for the same device. Note that Channel selection should match between LimeSuite Sink (TX) and LimeSuite Source (RX) blocks for the same device. RF frequency (callback function value): Set RF frequency for TX (both channels). LimeSDR-USB and LimeSDR-PCIe supports RF center frequency in range 100kHz–3.8GHz. LimeSDR-Mini supports RF center frequency in range 10MHz–3.5GHz. Sample rate: Select sample rate for TX. LimeSDR-USB and LimeSDR-PCIe sample rate must be no more than 61.44 MS/s. LimeSDR-Mini sample rate must be no more than 30.72 MS/s. LimeNET-Micro sample rate must be no more than 10 MS/s. This setting should match in LimeSuite Sink (TX) and LimeSuite Source (RX) blocks for the same device. Oversample: Oversample lets you sample TX signal at a higher rate than would be required to just preserve the desired signal frequencies. Possible values (multipliers): Default (i.e. 0), 1, 2, 4, 8, 16, 32. Default value uses highest possible value based on other settings. Oversample is connected to sample rate (see Sample rate setting) and there are limitations as show in Table 1, Table 2 and Table 3. Note that LimeSDR-Mini and LimeNET-Micro supports only same oversampling for TX and RX. NCO frequency (callback function value): Here you can adjust numerically controlled oscillator. 0 means, that NCO is OFF. Calibration bandw. : This setting is used to set bandwidth for TX calibration of each channel. This value should be equal to your signal bandwidth. 0 means that calibration is OFF. Calibration bandwidth range must be 2.5MHz–120MHz. PA path (callback function value): Select active power amplifier path of each channel. This setting also controls LimeSDR-Mini and LimeNET-Micro board path switch (BAND1/BAND2). When Auto(Default) is selected, RF path is automatically selected for LimeSDR-Mini and LimeNET-Micro boards depending on RF frequency. Auto(Default) sets BAND1 for LimeSDR-USB and LimeSDR-PCIe. Analog filter bandw. (callback function value): Enter TX analog filter bandwidth for each channel. 0 means that analog filter is turned OFF. TX analog filter bandwidth range must be 5MHz–130MHz. Digital filter bandw. (callback function value):Enter TX digital filter bandwidth for each channel. 0 means that digital filter is turned OFF. TX digital filter bandwidth should not be higher than sampling rate. Gain (callback function value): Controls TX channel gain. Gain range must be 0dB–60dB. First you should pick LimeSuite Source (RX) from LimeSuite category as shown in Figure 5. LimeSuite Source (RX) block appears in GNU Radio workspace as shown in Figure 6. To configure block double click on it. Now you can see settings as shown in Figure 7. 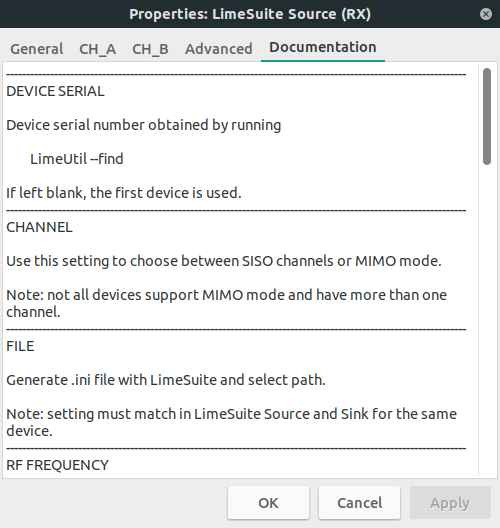 Note that Channel selection should match between LimeSuite Sink (TX) and LimeSuite Source (RX) blocks for the same device. LimeSuite Source (RX) blocks for the same device. RF frequency (callback function value): Set RF frequency for RX (both channels). Sample rate: Select sample rate for RX. Oversample: Oversample lets you sample RX signal at a higher rate than would be required to just preserve the desired signal frequencies. Default value uses highest possible value based on other settings. Oversample is connected to sample rate (see Sample rate setting) and there are limitations as show in Table 4, Table 5 and Table 6. Note that LimeSDR-Mini and LimeNET-Micro supports only same oversampling for TX and RX. LNA path (callback function value): Select active low-noise amplifier path of each channel. LimeSDR-USB and LimeSDR-PCIe possible selections: LNAH, LNAL, LNAW. LimeSDR-Mini possible selections: LNAH, LNAW. LimeSDR-Micro possible selections: LNAH, LNAL. This setting also controls LimeSDR-Mini and LimeNET-Micro board path switch. When Auto(Default) is selected, LNA path is automatically selected for LimeSDR-Mini and LimeNET-Micro boards depending on RF frequency. Auto(Default) sets LNAH for LimeSDR-USB and LimeSDR-PCIe. Analog filter bandw. (callback function value): Enter RX analog filter bandwidth for each channel. 0 means that analog filter is turned OFF. RX analog filter bandwidth range must be 1.5MHz–130MHz. Digital filter bandw. (callback function value):Enter RX digital filter bandwidth for each channel. 0 means that digital filter is turned OFF. RX digital filter bandwidth should not be higher than sampling rate. Gain (callback function value): Controls RX channel gain. Gain range must be 0dB–70dB. To use gr-limesdr blocks efficiently you can always double click on block, to open its settings and then check Documentation tab as in Figure 8 which can hint you what each setting does. The same applies to LimeSuite Source (RX) as well as LimeSuite Sink (TX). You can find FM transmitter example (FM_transmitter.grc) in gr-limesdr/examples directory. Open this example and you should see blocks as shown in Figure 9. Options block is always used in GNU Radio flow graphs. From GNU Radio Wiki: In order to make a hierarchical block, the parameters in the options block must be set properly. The id of the options block sets the module name and must be unique among the entire library of blocks (built-in and custom). The title parameter sets the display name for the block. The generate options must be set to "Hier Block". The category parameter sets the category for the new block. This category can be an existing category in the block selection window or a new category. Wav file source is used to create data source from an audio wave file. In order for this example to work you should choose gr-limesdr/examples/piano.wav file. Audio rate should be 48kHz. Wav file source could be changed to Audio source in order to transmit real time recording device data. NBFM Transmit block stands for narrowband transmit. This block performs as FM modulator. Rational Resampler block is used to change sample rate of NBFM output in order to meet LimeSuite Sink (TX) input sample rate. NBFM output sample rate (480kS) is multiplied by 25 and divided by 6 (480 000*25/6 =2 000 000). The result is 2MS. LimeSuite Sink (TX) is used to consume (transmit) samples at 2MS. WX GUI FFT Sink is used to analyze FFT of samples produced for LimeSuite Sink (TX) to consume. You can find FM receiver example (FM_receiver.grc) in gr-limesdr/examples directory. Open this example and you should see blocks as shown in Figure 10. 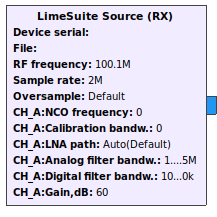 LimeSuite Source (RX) is used to produce (receive) samples at 2MS rate. Low Pass Filter filters unnecessary frequencies. Frequencies above 500kHz with transition width of 100kHz are filtered. Filter can be modified real time by using WX GUI Slider blocks in order to modify Cutoff Frequency and Transition Width. Rational Resampler block is used to change sample rate of Low Pass Filter output in order to meet WBFM Receive input sample rate. Low Pass Filter output sample rate (2MS) is multiplied by 48 and divided by 200 (2 000 000*48/200 =480 000). The result is 480kS. WBFM Receive stands for wideband FM receive. It acts as FM demodulator. Multiply const is used to adjust volume (amplitude) by using WX GUI Slider with Volume slider. Audio Sink is used to produce real time sound through playback device. You can find advanced FM receiver example based on “gr-rds” package example (rds_rx.grc) in gr-limesdr/examples directory. Before using this example you should install “gr-rds” package link. You can find GFSK loopback example (GFSK.grc) in gr-limesdr/examples directory. Open this example and you should see blocks as shown in Figure 11. Here you can see both GFSK modulation and GFSK demodulation parts to show realtime data processing by using single LimeSDR board. Ensure that you have antennas connected to your board or you may use attenuator instead. Choose your data source in block “File Source”. The data may containt text that you are about to send. “Packet Encoder” is used to add logical structure to raw bytes. The block takes as many bytes as Payload Length is defined and groups them with header and CNC which when left blank uses default values. “GFSK Mod” block performs GFSK modulation and then samples are sent by using “LimeSuite Sink (TX)”. We use “Quadrature Demod” block in order to convert complex samples to I and Q floating point sample stream and analyze them in “QT GUI Time Sink”. After data is sent we receive data by using “LimeSuite Source (RX)” and analyze it via “Quadrature Demod” and “QT GUI Time Sink”. “GFSK Demod” is used to extract packets who are decoded by using “Packet Decoder” and saved in file via “File Sink”. After we kill the flow graph we can analyze sent text data and received text data in order to see the results. You can find Signal Generator example (signal_generator.grc) in gr-limesdr/examples directory. Open this example and you should see blocks as shown in Figure 12. Here we have signal generator example. By using “Signal Source” block we can generate different waveforms (constant, sine, cosine, square, triangle and saw tooth) with different frequencies and sampling rates. “Signal Source” block is connected directly to the “LimeSuite Sink (TX)” block which then transmits generated data. In order to see our wave form we use “QT GUI Sink” and spectate waterfall, FFT, time and constellation graphs. In order to configure device while running this flow graph we add baseband, TX gain, NCO frequency, NCO direction, analog and digital filters controls by using QT. This way we have powerful Signal Generator. To try Signal Analyzer and Signal Generator examples we can execute them in single flow graph and try to analyze sent and receive sample by creating loopback conditions with antennas or attenuators and cables. You can find Signal Analyzer example (signal_analyzer.grc) in gr-limesdr/examples directory. Open this example and you should see blocks as shown in Figure 13. In this example we use “LimeSuite Source (RX)” to receive samples and analyze them by using “QT GUI Sink”. In “QT GUI Sink” we can see waterfall, constellation, time and FFT graphs. By using QT controls we can adjust RX gain, baseband, NCO, analog and digital filters. To try Signal Analyzer and Signal Generator examples we can execute them in single flow graph and try to analyze sent and received samples by creating loopback conditions with antennas or attenuators and cables. A DVB-T terrestrial digital TV transmitter example (DVB_T_2k_64QAM_TX.grc) is provided in gr-limesdr/examples folder for testing. Transport stream file is quite big hence should be downloaded adv8dvbt23qam64.ts. Place this file to gr-limesdr/examples folder. This will set up VLC to receive a DVB-T data stream transmitted with a carrier frequency of 700MHz. Note: you need a fairly capable CPU for realtime encoding and transmission of a DVB-T stream. Lack of processing power for stream encoding and transmission usualy results in the received video stream stuttering, random glitches or losing audio (typically accompanied by VLC's 'TS Discontinuity' errors in the terminal).